Fall will be upon us before we know it, folks. And when it comes time to look critically at my fall and winter closet, to do my inventory, and make my list of what I might need, or want, I plan to be ready. And ready for me means having a sense of the looks that have walked down the runway, and featured in fall ad campaigns, and an idea of the trends that are being espoused. Whether I buy into the trends (or buy them literally) is another matter, of course. In other words, I’m currently seeking fall inspiration. So when fall comes I can make good decisions about what I will, and will not, buy. I did a quick run-through of three of the big fashion prognosticators: Vogue, Bazaar, and Elle. According to them, red will be everywhere. Along with plaid, checks, and florals. Lingerie as daywear, men’s-wear inspired jackets and suits, and western inspired whatever. Puffa coats, track suits, and polka dots. Futuristic patterns and retro hats. Crazy fur and/or feathers, and shiny silver and glitter. Phew. That just about covers everything I would want to wear, and most of what I wouldn’t be caught dead in. The wouldn’t-be-caught-dead-in stuff is easy. Anything shiny or with glitter, lingerie as a dress, cowboy boots (at least not anymore; they kill my feet), florals that look like drapery, and feathers of any kind. For what I might covet come September, I usually look to the designers I admire, and not at the runway reports. 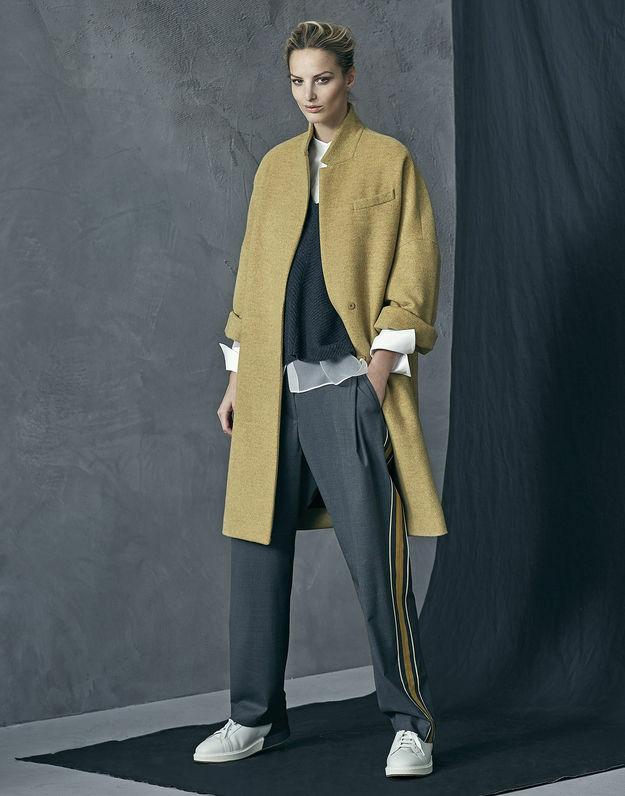 Designers like Brunello Cucinelli. For louche and luxurious looks, you can’t beat Cucinelli. The epitome of retirement chic, don’t you think? See all the Brunello Cucinelli looks here. I also love Fabiana Fillippi. Like the looks below from her website. More Fabiana Fillippi looks here and here. Not that I can afford either Brunello Cucinelli or Fabiana Fillippi. This is just for inspiration, you understand. Looks from the Fabiana Filippi website here and here. 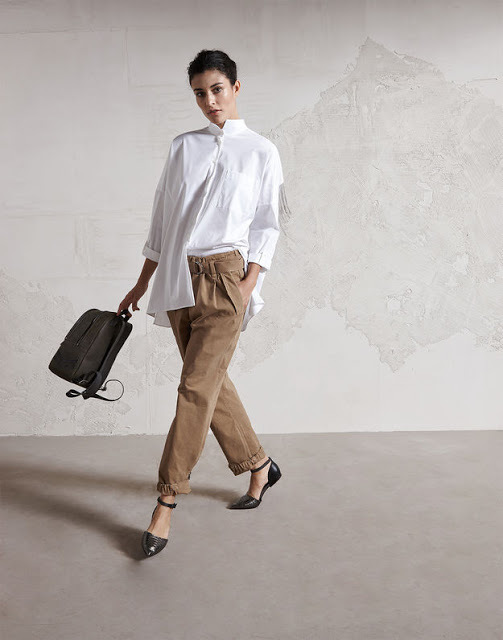 And because readers of this blog who live in the UK have mentioned Margaret Howell to me a few times, and since I will be in the UK in the fall, I checked out her fall and winter offerings. This shot is from the Autumn-Winter 2017 campaign on her website. I love the narrow, plaid, mid-calf skirt with the sneakers. So while I love these looks, I’m not really any closer to being ready for fall shopping. But I’m just getting started. I’ll be seeking inspiration for a few weeks yet. And I may be up for a bit of a profile change. I didn’t have any luck with wide-leg trousers for spring, but this fall, I might reconsider. Maybe with a chunky sweater, and a blazer, and boots? And maybe a long skirt to wear with boots, and my short tweed coat? Hmmm. We’ll see. Until then, I’ll be dressing for summer, but falling asleep each night with visions of chunky-knit sweaters in my head. Chunky-knit sweaters and long skirts, caramel coloured corduroys and tweed jackets, and boots, lots and lots of boots. And to get us in the mood for fall fashion and all the nonsense of those HUGE September Issues, here’s a weird little video that I found on Vogue.com. All about how Vogue shot their September issue with Jennifer Lawrence. Shooting a magazine cover is complicated, I guess. All those creative types. And farm stylists…even. Ha. Still, Jennifer Lawrence is adorable. And she certainly seems to be having a “moment,” as they say. But seriously, I know you don’t take all this trends stuff to heart. All the furor of fashion. Neither do I. But I just love all the textures and colours of fall. All the gold, and burgundy, and green, and chocolate brown. All the tweed, and leather, and the cozy knits. I don’t pay too much attention to what I’m supposed to be longing for this season. I just want to wear clothes that suit me and make me feel fabulous. Or good, at least. I’ll settle for good. Hubby and I are heading down east tomorrow. In fact, when you read this we’ll probably already be there. We’ll be at my mum’s for a week or so, and we’ll be spending a few days in Saint Andrews, New Brunswick. Saint Andrews is Canada’s answer to Cape Cod. Except smaller, and with fewer tourists. I haven’t been there for years. I’m really looking forward to it. I won’t be blogging when we’re away, but I’ve scheduled a couple of relevant posts from previous years. If you haven’t read them already, I hope you enjoy them. See you in two weeks. And in the meantime. Back to fall fashion. What is inspiring you for fall this year? Back … read it all. Me, too — I love fall clothes. That first cool breeze makes me want to buy long plaid pleated skirts and twinsets — the old, real twinsets with pearl buttons. And a backpack. I wonder if saddle oxfords will ever come back. All that would look so great with ray-bans, eh? I remember my aunts and sisters wearing those twin sets with the pearl buttons. Here in Fredericton, my uncle used to buy "kitten sweaters" for my aunt for Christmas; they were made by the Kitten factory in Ontario. They were sold at a "Ladies" store called "Vey's" I think. Where the sales assistant pulled the sweaters from under a glass counter for you to look at. When I was very young I imagined that the Kitten factory made kittens and not fine wool sweaters. Ha. I'd forgotten all about that. Have a great holiday! We stayed a night in a b & b in Saint Andrews a couple of years ago and thought it was wonderful there. Thanks Patricia. I'm looking forward to some fresh seafood. I like the Cucinelli & love all the Filippi -shame I'm not rich . Nice to see Margaret Howell getting a mention . She is very quietly chic & uses wonderful fabrics . If you turn her trousers inside out they are a little work of art , such attention to detail . I even like the black ankle socks . Have a lovely holiday , hope your mum is well . I'd never heard of Margaret Howell until you mentioned her a while ago. I'd love to own something of hers. Maybe when I'm in London I'll find something. Ha. About those black socks… I was surprised to like them too. I guess I should never say never! Funny video! Fall is my favorite season change. I'm inspired by texture this fall. Fall is the best, isn't it? I'm much more comfortable in sweaters and jeans than in shorts and tanks. Thanks, Iris. It's cool this morning at my Mum's, but I'm enjoying tucking back into bed with my latte and my i-pad after Stu has left to go golfing. The weather here has been beautiful. The good weather we haven't had in Ottawa! In the meantime, if you are reading on an i -pad or tablet, you should be able to switch to the "mobile" version which is a very different look designed to fit on an i-phone screen and the text is on a white background. If you are reading on a desktop, can you play with the size of font on the screen? I'm not sure how you do that, though. Ha! That video was funny. Seems like lots of the stuff I'm already wearing is now considered a trend this year. Also everyone is doing vintage reproductions. I prefer the real thing. I was thrilled to see "vintage inspired" hats in the list of trends. I should dig out some of my actual vintage hats… maybe. I always say that and never do it! Hope that ypu are having good time and that your family is well! So,I don't plan to shop much,ankle boots and wool trousers,maybe a longer sweater…..I only need an inspiration to style all my stuff differently! I love to see chunky-knit sweaters (think Shetland or The Bridge)-but it is not for me and our climate-never the right temperature,neither in or out the house! Great post Sue. I thoroughly enjoyed reading it. Hope all's well with your mum and brother and that you and Stu have a good couple of weeks with them. Thanks, Rosie. I know. Time sure flies. My eldest daughter spent a summer working as a waitress in Saint Andrews toward the end of her university years. She said that she knew she'd be spending the rest of her career being a nurse and she wanted a completely different experience that summer. (Previous summers, she had found nursing-related job experience.) She loved Saint Andrews, and I still regret that we didn't make it out there for a visit while she was there. — Denise L.
We're back at my Mum's now…St Andrews was totally charming. You should go. Love the inclusion of the Vogue video. So cool and funny.. I agree with others. Please change the black background and white text. Not easy to read. To be honest I don't pay attention to what people say is the next trend. I like to go my own way. At least I think I do. Who knows what affects you while shopping. But I hat to be so on trend. I see it walking down the street and it's so obvious that someone is so right on the latest trend. That's a turn off to me. Me too, Sandra. I hate to feel like I'm being dictated to by trends. Although our eye does change, and what looks great one year suddenly seems dated. So evolving is good, just not jumping at every trend, I guess. I'll be looking at making a format change on the blog. I just have to figure out what I want and how to achieve that. I don't have a "tech advisor" on "staff." Ha. Just me and Mr. Google, and lots of experimentation. Such classic elements with a quirky twist. I can picture you in any one of these! My August and September fashion magazines are sitting nearby, ready for me to peruse. I haven't yet but I'm looking forward to it. Love love love fall fashion season! Thanks, DA. I love the feeling of turning the page that comes with September. I simply can't think about fall yet! I love autumn when it gets here, but I always want summer to last just a little bit longer! Perhaps I'll feel differently after I see a preview of Cabi's new fall line tomorrow evening though. I agree with the chunky sweater comment, as I am usually too hot to wear them too! It has to be below 0 Fahrenheit before I break them out. Love the designers you feature! I was at a favorite consignment store this week and left a jacket that I have to go back to buy. Have a great trip and visit with your family. Oh dear. I fear that conundrum! Yes thank you – now I can enjoy reading your blog 'as you present it'.